Associació Cultural El Rebrot: Nou Espectacle d'Eugeni Alemany. 29 de juny a Rafelcofer!! Nou Espectacle d'Eugeni Alemany. 29 de juny a Rafelcofer!! Després de l’èxit de “T’ho dic sense acritud”, l’humorista i presentador EUGENI ALEMANY arriba “EN PERSONA GUANYE”, un espectacle còmic amb el segell d’Eugeni: 100% valencià i 100% imprevisible. En “EN PERSONA GUANYE” Eugeni torna a fer gala d’un dels seus majors talents: la capacitat d’improvisació i d’interacció amb el públic. Un text molt treballat que es combina amb continues al·lusions al públic i a tot el que està passant en eixe moment. 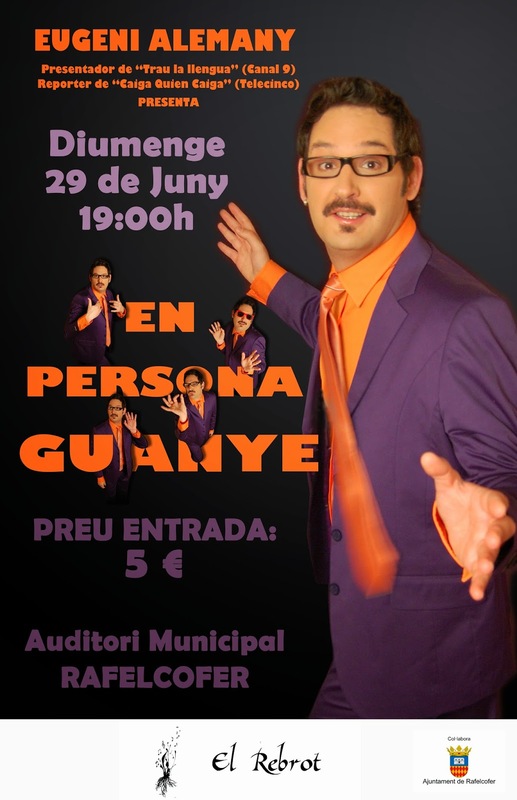 Ja ho saps, diumenge 29 de juny a les 19:00 h a l'auditori de Rafelcofer, per 5 €, NO T´HO POTS PERDRE!!!! Christian Dior Outlet uses the best quality cow two skins, with natural leather texture maintained a delicate appearance and texture, and at the same time, all natural tanning method with the production process of Europe, to ensure the perfection and gloss and durability. The bold use of color and quality of patent technology, light golden polished button design and sapphire blue, wine red classic color, is the fashion design inspiration and perfect production technology has been dripping show. Buckle to create exclusive by "Ferragamo" chief designer, with a high-quality YKK drawing, after the 5000 sliding test exclusive zip, fine steel ion rivet button and accord with human body mechanics principle of portable design Martchee skillfully combines many fashion elements, highlight the fashion forefront of extraordinary style, at the same time in China manufacturing rigorous process, create top quality comparable to replica bags the international luxury brand, created the industry position king. "Most of the international famous brand is to detail processing of high quality and perfect is known, while the Marchee at this point is the real implementation of the domestic brands' back ', it meets the requirements of GUCCI standard.Dior Outlet brand marketing director of Martchee's "international status" expressed full recognition. The woman loves purses, seem to be is the eternal agreement. Whether it is socially beautiful, or war game proudly, with a taste of the Martchee is the best interpretation of modern occupation female style. The Martchee and GUCCI cooperation, more is to do the best footnote to its international status. Or elegant, or elegant, Martchee for this opportunity, dazzling in the world, leading the trend.